TOWN OF BROOKLINE vs. CO-RAY REALTY COMPANY, INC., & others. There would be a violation of provisions of the zoning by-law of Brookline forbidding any use of premises in single residence districts except for certain enumerated purposes including one family dwellings and "a park or ornamental grounds" if the owner of an apartment house located wholly in Boston were to use adjacent vacant land of his in a single residence district in Brookline as a rear yard of the apartment house and as a means of access by walks from a street to rear service and boiler room entrances of the apartment house and thence to apartments therein, although such vacant land otherwise were to be used only for a lawn with shrubs, trees and flowers. A landowner was not entitled in a suit in equity to declaratory relief determining the effect of the zoning regulations of a city with respect to a certain proposed building on his land where it appeared that the city's building commissioner, who had granted a permit for the building, was a party, but that an actual controversy concerning the matter had arisen between the building commissioner and "the neighboring . . . home owners," that only one of such owners was a party, and that the city itself was not a party: the rights of such owners were not adequately represented by the building commissioner and the giving of declaratory relief would not terminate the controversy. In a suit in equity by a town against an owner of land located both in the town and in an adjoining city and against the building inspector of the city, who had issued a building permit for an apartment house on the land in the city, where it appeared that proposed use of the land in the town as a rear yard of and means of service access to the apartment house would be in violation of the town's zoning by-law and should accordingly be enjoined and that without such a rear yard the apartment house would not be in conformity to the city's zoning regulations, the final decree should not include an order sought by the town against the building commissioner for revocation of the building permit with respect to the land in the town: it was not to be assumed that the building commissioner would not comply with the city's regulations. BILL IN EQUITY, filed in the Superior Court on September 22, 1949. A demurrer of the defendants Miller was overruled by Forte, J., who reserved and reported such action. A further reservation and report was made by Warner, J., after hearing on the merits. The sketch appearing on page 208 was included in the record. D. G. Rollins, (A. J. Santry, Jr., with him,) for the plaintiff. C. B. Rugg, (H. S. Streeter with him,) for Co-Ray Realty Company, Inc.
M. Michelson, (D. S. Miller with him,) for the defendants Miller. to build a twenty-eight family apartment house, and to use part of the Brookline land as a rear yard and service entrance. The nearest houses in Boston and in Brookline are single family houses. The bill also seeks the revocation, with respect to the Brookline land, of a building permit allegedly issued to Co-Ray by the defendant building commissioner of Boston. Upon motion of Co-Ray, David S. Miller and Dora Miller, owners of a single family house in Boston on the opposite side of Evans Road from the Co-Ray property and in the same "general residence district, R-40," were made parties defendant. The amended answer of Co-Ray contains, in the nature of a counterclaim, an application for declaratory relief, seeking binding declarations as to the effect of certain provisions of the Brookline zoning by-law and of the Boston zoning regulations. The Millers demurred to the amended answer, and filed both a motion to dismiss and an answer praying in substance that the counterclaim contained in the amended answer be dismissed as to them and, in the alternative, that the proposed erection of the apartment house be declared in violation of the Boston zoning regulations and building code. The demurrer was overruled by a judge of the Superior Court, and the Millers appealed. The case and the motion to dismiss were heard by another judge of the Superior Court chiefly, and so far as now material, upon agreed facts. The judge found the facts to be as agreed. On the same date the first judge reserved and reported the questions of law arising out of the interlocutory decree overruling the demurrer, and the second judge, without making any decision, purporting to act under G. L. (Ter. Ed.) c. 214, Section 31, reserved and reported the case and all questions of law on the matters heard by him, "such decree to be entered as justice and equity may require." No argument has been made that the action of either judge is not effective, and we treat the case as here in all respects intended. Corey Road runs north and south. Evans Road runs east and west. The Co-Ray property is at the southeasterly corner. The proposed structure is L-shaped and consists of four sections of apartments, each section having its own front and rear entrances. Two sections run north and south, parallel to Corey Road, and two run east and west, parallel to Evans Road. Two front entrances will face west toward Corey Road, and two will face north toward Evans Road. Each front entrance will have a different Boston street number. The eastern wall of the building will be at or close to the Boston-Brookline boundary line. There will be left a space of at least twenty-two feet between that wall and the eastern line of the property. This space is to be the rear yard required by the Boston zoning regulations, which provide: "In a forty foot district: -- . . . Rear Yards: There shall be behind every building other than an accessory building a rear yard extending across the entire width of the lot and having a minimum depth of twenty feet" (Section 12). St. 1924, c. 488, Section 12. Rear Yard is defined: "A space on the same lot with a building, between the extreme rear line of said building and the rear line of the lot and open and unoccupied except by an unenclosed porch not exceeding sixty square feet in area" (Section 1). St. 1941, c. 373, Section 1. The space on the southerly side of the lot would be smaller than is prescribed in the regulations for a rear yard, the southern wall being ten feet from the Boston-Brookline boundary line, and the lot of the adjoining owner eight feet south of that boundary line, making only eighteen feet between the structure and the lot line. east side of the building, would open onto the Brookline land, and a person leaving by either entrance would be on the Brookline land after taking a step or two. That service entrance would give rear access directly to eleven apartments and indirectly by way of the basement to the boiler room and eleven more apartments. The latter eleven apartments are to have a separate service entrance opening onto the Boston land. These twenty-two apartments could be reached also through the boiler room entrance. 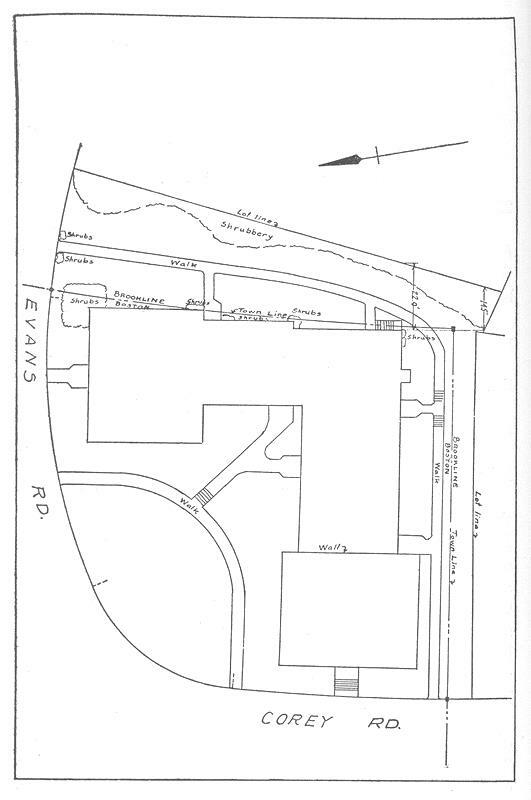 Except for these walks, which are to aid in the use of the service and boiler room entrances, the land east of the building is intended to be used only for a lawn with shrubs, trees, and flowers "at the boundary of the lot line." Actual construction of the apartment house was commenced on August 17, 1949, but was suspended on September 22, 1949, on the filing of the bill. This work consisted of excavation and the building of foundation forms. Through error a corner of the excavation and foundation forms projects eighteen inches onto the Brookline land. When the permit was issued, part of two proposed areaways and the proposed underground fuel tanks were to be located on the Brookline land. In the court below the town and Co-Ray stipulated that no parts of the building, tanks, or areaways are to be located on the Brookline land. be made in a single residence district as of right: (a) A detached one-family dwelling. (b) A church or place of worship. (c) A public school, a playground, a park or ornamental grounds. (d) A purpose accessory to any of the foregoing, including a private garage for not more than three non-commercial motor vehicles or a private stable." This mere enumeration of uses suffices to show that the proposed use is not authorized in a single residence district in Brookline. The by-law covers land as well as buildings. Lexington v. Menotomy Trust Co. 304 Mass. 283 , 284. The incidental presence of a lawn with shrubs, trees, and flowers "at the boundary of the lot line" would not transform the rear yard and service entrance of an apartment house into the permitted use of "a park or ornamental grounds." Fenwick v. Old Saybrook, 133 Conn. 22, 29. Carrolo v. Zoning Board of Westerly, 67 R. I. 128, 130. See Hubel v. McAdon, 190 Iowa, 677, 679. We are of opinion that the Brookline zoning by-law applies and is a bar to the proposed use. See Great Neck Estates v. Bemak & Lehman, Inc. 223 App. Div. (N. Y.) 853, reversing 128 Misc. (N. Y.) 441; affirmed 248 N. Y. 651. See also Prospect Park Borough v. McClaskey, 151 Pa. Super. Ct. 467.
arises from the fact that Co-Ray is not interested in any of those permissible uses and is attempting to by-pass the Brookline zoning by-law and treat it as nonexistent so far as the Brookline land is concerned. It has not been shown that the by-law is not a reasonable regulation of the use of property in the public interest. See Seekonk v. John J. McHale & Sons, Inc. 325 Mass. 271 , 274; Barney & Carey Co. v. Milton, 324 Mass. 440 , 445. See also Nectow v. Cambridge, 277 U.S. 183. Without the rear yard there would be no compliance with the Boston zoning regulations. We, therefore, do not consider numerous questions raised by the defendants Miller. As the result is unaffected, we assume that the Superior Court had jurisdiction of the matters of declaratory relief raised in the amended answer of Co-Ray. But the defendants Miller are not the only persons interested in those matters. It is an agreed fact that an actual controversy has arisen between the defendant building commissioner, on the one hand, and the defendants Miller and "the neighboring Boston home owners" in the same residence district, on the other, as to whether the proposed structure will violate the Boston zoning regulations or building code. Except for the Millers, none of these home owners is a party. We cannot say that their rights are adequately represented, as if by the city, by the defendant building commissioner who granted the permit. Hence, a declaration, if made, would not terminate the uncertainty or controversy. G. L. (Ter. Ed.) c. 231A, Sections 3, 8, inserted by St. 1945, c. 582, Section 1. Kilroy v. O'Connor, 324 Mass. 238 . We do not decide whether the demurrer of the defendants Miller to the amended answer should have been sustained on the ground of nonjoinder of necessary parties defendant or on any other ground. Those questions are now academic. The hearing on the merits has demonstrated the insufficiency of the amended answer as against the defendants Miller. The counterclaim in Co-Ray's answer raises no question as against the town which is not actually presented by the bill. No action is to be taken on the present showing on the prayer of the bill for an order against the defendant building commissioner for revocation of the permit. It is not to be assumed that this public officer will not comply with the zoning regulations of Boston. Dullea v. Retirement Board of Peabody, 317 Mass. 525 , 528-529. School Committee of Gloucester v. Gloucester, 324 Mass. 209 , 220. The interlocutory decree overruling the demurrer of the defendants Miller is affirmed. An interlocutory decree is to be entered denying without prejudice the motion to dismiss. A final decree is to be entered (1) dismissing the counterclaim contained in the amended answer of the defendant Co-Ray Realty Company, Inc., with costs to the defendants Miller; (2) enjoining the defendant Co-Ray Realty Company, Inc., from using any part of the Brookline land as a rear yard and service entrance for the proposed apartment house, with costs to the plaintiff against this defendant; and (3) dismissing the bill against the defendant building commissioner of Boston.